The Green Power KPE-1304 Juice Extractor uses powerful magnets and bio-ceramic materials in its Juice Bowl and Twin Gears. The low speed rotation (160 rpm) of the unique, powerful, twin gear impeller and pressing system generates virtually no heat that would cause denature to the juice. MSRP $499 Based on the Manufacturer's Suggested Retail Price, this juicer is more expensive than average and is priced in the top 3% of juicers. Two Gears √ This masticating-type juicer has two augers so that foods can be crushed more easily at lower RPMs, which greatly minimizes any oxidation effects. 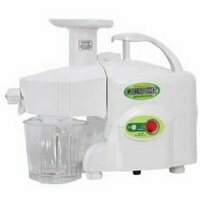 Motor Warranty 10 Years When compared to other juicers, this appliance has a longer than average limited motor warranty. The motor warranty is a good indicator of motor durability. Star Rating 4.7 User reviews, ratings, and feedback indicates that this juicer is rated higher than average by 7 users and ranks in the top 8% of juicers.